Hi everyone! 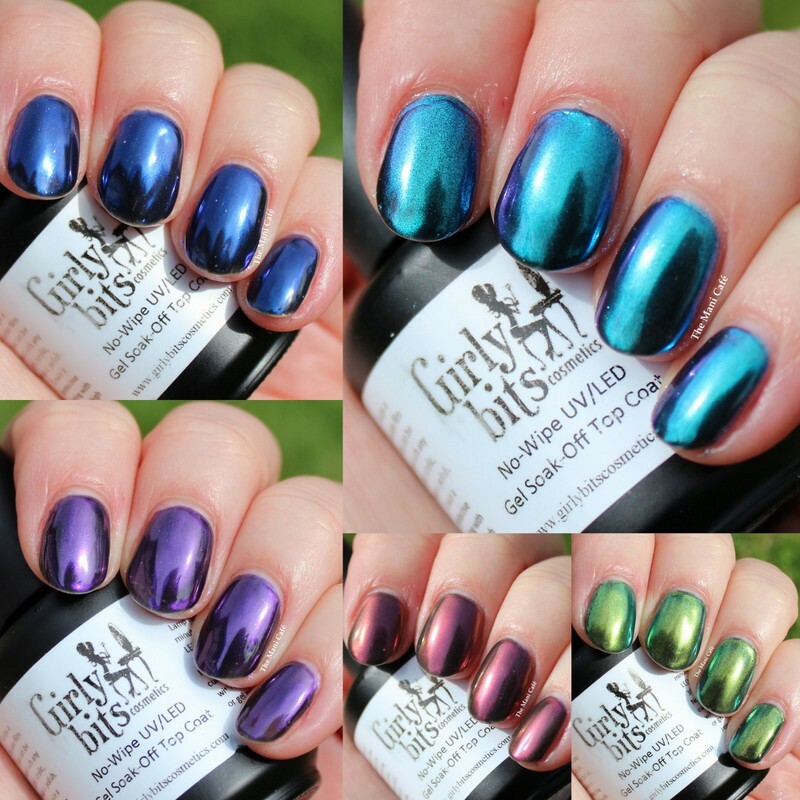 I'm back with some more of the awesome special effects powders from Girly Bits. Today I'm sharing the Silver and Gold chrome finish powders. You've probably all seen the chrome nails which have been posted literally everywhere online by now. The effect is really cool and a lot shinier than chrome polishes. I used 2 coats of black gel polish and applied the chrome powders by buffing with my finger. I finished with a coat of Girly Bits Seal The Deal (no wipe UV/LED Gel Soak-off Topcoat). First up, silver. This is my favourite of the two and I think the more 'classic' chrome look. I love how you can also use the silver over different colours to get a tinted chrome finish. You can see my pink chrome nails here! Next up is the gold powder. I find the finish ever so slightly less shiny than the silver but still really awesome. I think I'm just more of a silver fan than gold! This was a fun mani to wear though! The powders are really easy to use and I really love the finish. I got lots of compliments when wearing these. What do you think of the chrome look? The Girly Bits products in this post were provided for my honest review. Hi everyone! Today I have a super fun post for you with the new Duo Chrome Effect Powders from Girly Bits. These new powders are similar to the chrome powders we've been seeing for a while but they're multichome! Each powder comes in a small pot and appears to be white with an iridescent coloured shimmer peeking through. They come to life and reveal all their colour when applied to the nail. They have all the fun and colour shift of a duo chrome polish but with the shiny finish of chrome powder. For my swatches, I started out with 2 coats of black gel polish. I then applied a coat of Girly Bits Seal The Deal, a no-wipe UV/LED gel topcoat. I then applied the powder by buffing it in with my finger. I topped with another coat of Seal The Deal. Majestic - appears as a pink iridescent in the pot and over black shows as a gorgeous rich purple/pink chrome. Definitely one of my favourites. Gaze - My favourite of the bunch for sure. Shifts from teal to purple! Reminds me of some of my favourite multichrome polishes but in shiny chrome format! Lust - Rich vibrant blue. Super classy way to wear chrome in my opinion! Zephyr - Another favourite. Again, this one reminds me of some multichrome polishes I have but in a shiny chrome version. Shifts red, bronze, slightly orange. The shift in this one is beautiful. Resolution - Shifts through greens to gold. Reminds me of cat's eyes. I'm not the hugest green fan but I love this. Hi everyone! Today I have a really exciting product to share with you. If you like really holographic nails, you absolutely NEED this powder from Girly Bits! This is the new Fine UltraChrome Holographic Powder which is launching on May 15th and it gives you the most holographic finish ever. For this mani I used 2 coats of black gel polish then applied the holographic powder, buffing it on with my fingertip. I finished with a coat of Girly Bits Seal the Deal UV/LED Gel Soak Off topcoat. I am loving this gel topcoat. It is definitely the best I've tried and works amazingly with the special effect powders. It doesn't dull their effects at all! I also tried out layering a jelly polish over the holo powder which I totally love! I used Chanel Sunrise Trip but I can imagine this would be stunning with any colour! The holo effect is so strong that it shows through well and makes a super vibrant colourful holo! So what do you think of the holo powder trend? I love it and I couldn't stop staring at my nails. I'll definitely be wearing this often, especially for summer and sunny weather! The Fine UltraChrome Holographic powder will be launching (along with the Duochome Special Effects powders) on May 15th!